ABSOLUTE WATERFRONT EXECUTIVE APARTMENT Overlooking the Pacific Ocean. 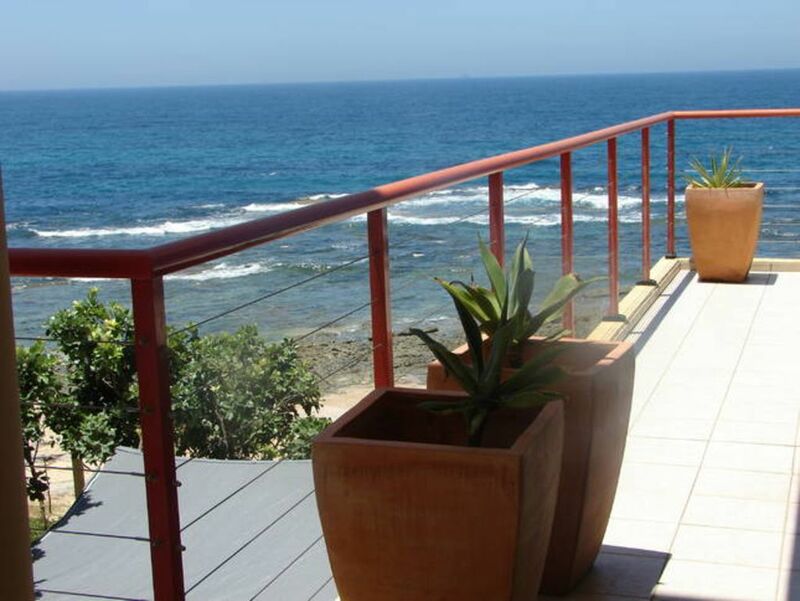 Watch the sunrise over the ocean from your bedroom or wander down to the sandy beach at your doorstep. Blue Bay is approximately 80 klms North of Sydney, Next to the popular Entrance Beach. The ocean is our back yard. Enjoy Rock Fishing, or relaxing walks along the beach. Swim in the Ocean or The Entrance Ocean Baths just 4 mins walk away.Town Centre, supermarket & Cinema nearby. Tuggerah Lakes Golf Course is within easy driving distance. OR just sit back, relax and enjoy the view! "The perfect getaway. Thank you. We even saw DOLPHINS"
-3 Bedroom Oceanfront Unit (sleeps 6 ADULTS). Boasting of panoramic views of the ocean, rockpools and up the coastline as far north as Norah Head Light House.Take in the breathtaking views through the floor to ceiling windows of the main bedroom, modern well equipped kitchen and airconditioned lounge area. BBQ On the units very generous "L" shaped balcony. 1 Queen(ensuite & WIR),1 Queen, 2 single beds. There are only 3 units in the building. "Ripples" takes up whole of 2nd floor. No Parties except with prior approval. Perfect for your special occasion. We had a wonderful, relaxing stay at Ripples. The unit was clean, functional and so spacious. With 6 people staying it was easy to spread out and just relax. It was wonderful to be able to walk to the Entrance along the beach and shore line. The view from the living area and balcony was just magnificent! We will definately stay again. It would have been handy to have another set of keys; on occasions we split up and then found it difficult to share just one set of keys to the unit. A truly lovely property. Spectacular views, beautifully clean & equipped with everything we needed. Will definately return to Ripples. Fabulous property, but not well cared for. Very well equiped, lots of space. Sue was very helpful. Will definitely stay again. Beach, rocks and sea pools great for kids. We were so happy with the beach view which was outstaning, very spacious apartment and short distance to the centre of The Entrance. To top it up, Sue (the owner) was so nice and accommodating. Highly recommend to a family who is looking for a nice apartment in The Entrance. We stayed here for a weekend in May 2014 and the views are absolutely stunning. On the first night, a full moon lit up the ocean and it was just magic. Lots of great beaches to explore, rock pools, bay or surf swims and plenty of shops and restaurants nearby. The apartment is spacious and well laid out. The bed was very comfortable and the kitchen very well stocked. We eat breakfast on the verandah, enjoying the views, and really felt like we were on holidays. Highly recommended and very prompt and friendly service from the owner. CAN'T WAIT TO COME BACK! !SUE, THANK YOU.. WHAT A FANTASTIC ESCAPE.MY SISTER AND I JUST LOVED IT!OUR LONG WEEKEND THERE WAS THE PERFECT PANACEA. I'LL BE BACK.. JUST PERFECT!